Turning circle radius gives an indication of the space required to turn a particular vehicle. Hence, the higher the value of turning circle radius, the higher is the space you need to turn the vehicle completely and vice versa. This parameter is closely related to the steering geometry and the suspension system of the vehicle under consideration. The effectiveness of this specification of a vehicle is clearly evident while maneuvering in a crunchy parking space. Technically speaking, it is the radius (or the diameter) of the circle made by the outer wheels of the vehicle while making a complete turn. Naturally, turning circle differs for every kind of vehicle. Legally, manufacturers must specify the turning circle radius or diameter. Hence, it appears in the specification sheet of every vehicle. 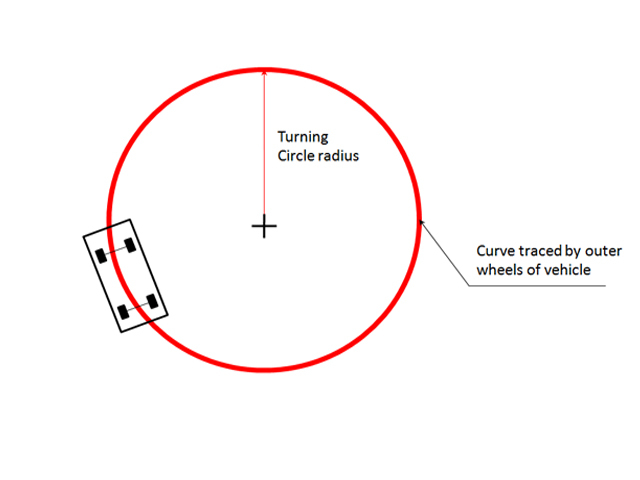 How is turning circle radius measured? In an experimental determination of turning circle radius or diameter, a vehicle must take a turn either in the left or right direction in full or lock condition i.e. an extreme position of steering wheel. Suppose that such a vehicle is taking a turn towards the right hand side. In such a situation, wheels on the left side will be the outer wheels. Hence, the radius of the circle traced by these wheels will give the turning radius of the vehicle. Alternatively, it is also possible to calculate turning radius based on the wheelbase and other suspension geometry parameters. Thus, the larger the value of turning radius, bigger is the space you need for a vehicle to take a turn. Generally, vehicles equipped with electric power steering have smaller turning radius compared to that of ordinary vehicles. The standards or the requirements of turning circle of the vehicle are specified in various technical standards which are generally developed country wise. The Indian requirements are specified in the Indian standard IS 12222.2011. Home » Technical Anatomy » What Is Turning circle radius or diameter & how is it measured? How The Electronic Pedestrian Protection (EPP) System Saves From Injuries to Pedestrians? How Autonomous Emergency Braking System (AEB) helps to prevent a collision?